Moment by musical moment; song by mind-blowing song the Fighters o’ Foo shattered the threshold of human-tolerable excellence repeatedly throughout their 2 hour 7 minute set. Each time I thought they'd reached the pinnacle, they effortlessly took us another step higher. This morning, 20,000 people in South Florida woke up and went back to life as usual but will themselves be never the same. There’s a new standard now- a new expectation going into every concert from here forward, and we are all better for it. For those who couldn’t be there last night, I’m more than grateful for the opportunity to re-live the night for your reading pleasure. Since I know I have some ADD readers, I'll try to write along two tracks: for those of you who want every detail, read straight to the bottom of the page; for those of you who just want the highlights, read until you see * and skip to **. I have so much to say about the Foo Fighters that I don't want to spend much time talking about how great Jimmy Eat World was. Overall they were suprisingly good; solid vocals, tight band, several great songs. I only wish they had tailored their performance a bit more for a live setting instead of playing their songs exactly how they're recorded. I've already described the opening of the concert above, so I'll pick it up from there. After the opening song "Let it Die", they rolled right into Pretender, followed immediately by Times Like These. When the final chord of Times Like These had rung out, Dave addressed the crowd for the first time: "Hey! How ya' doin'?! Listen uhhh, I guess we've been a band for a really long time now, sooooo... that means we've got a lot of [stinkin'] songs to play for you guys tonight." To which the crowd responded with a deafening scream. "So, this one's off our third record... it's called 'Breakout'" If you know the song, it needs no explanation for how it rocked; if you don't know the song, no explanation can do it justice. Let's just say it was one of the launch-pad, ceiling-raising moments I described earlier. Breakout led seamlessly into the set: Long Road to Ruin, DOA, Learn to Fly, and This is a Call- all with hardly a breath for applause between. Then Dave walked 1/2 way out on the catwalk and engaged Chris Shifflet in a sort of guitar duel, each one echoing solos and improvising off the other. This went on for a matter of minutes, gradually accellerating in intensity until a crack of the snare drum propelled the whole band into the intro of "Stacked Actors." Incidentally, this was the moment when they finally lost their audience to cardiac arrest; if Dave had screamed any louder, if the drums had kicked in our chest cavities any harder, if the lights had burned any hotter or flashed any brighter, I'm pretty sure it would have been the end of the world as we know it. And to add insult to injury, they filled 10 minutes in the heart of the song with a blistering drum solo and a full-band spontaneous jam. Dave, being the showman that he is, was sensitive to the cardiac needs of his audience and swaggered away from the heat of the main stage (where the lights now dimmed to black), down the catwalk (which cut straight through the middle of the room), directly to the secondary stage that had now begun to descend from the ceiling in a hue of red light (I took this picture with my phone). As he walked, and as the stage descended from (heaven? ), the simple yet genius opening riff of "Skin and Bones" rang out in the first acoustic guitar tones of the night. Once the stage had made its landing, Dave and the band found their places (Dave still vamping on the intro to Skin and Bones) and played an acoustic set including Skin and Bones, Marigold, Hero, Cold Day in the Sun, and But Honestly. Between "Hero" and "Cold Day," there was time for band introductions, small talk and compliments to the number of Floridians "who actually like us," and even a triangle solo (a little somethin' for everyone). As described above, Everlong led back to the main stage where the band would once again threaten the lifespan of those whose hearts had finally just recovered. 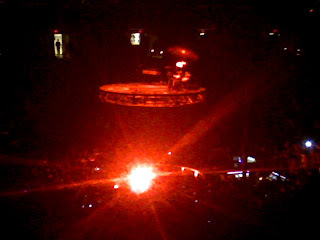 Monkey Wrench hit immediately after Everlong, followed by Dave's inspiring message: "I just have one thing to say... ~BELLLLLLLCH~." Don't know if you've ever heard a gutteral belch through an arena rock sound system, but it easily rivaled my childhood babysitter's talent of burping the entire alphabet in one smelly breath. And of course the crowd cheered and loved him all the more for sharing his bodily dysfunctions with the masses. But the laughter was suddenly overpowered by the ultra-distorted intro of "All My Life," which would end with a huge drum fill and a thick, rolling chord- Dave screaming over it all "THANK YOUUUU!" 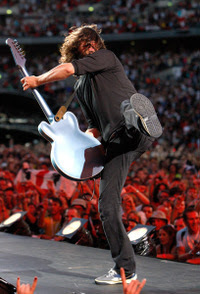 ** When the band had left the stage following their final song, there was continuous applause and peircing screams for nearly two minutes in virtual blackout when suddenly something appeared on the jumbo screens in black and white: a live video feed zooming in on the night's set list, then a moment later on Dave Grohl backstage. Dave gestured silently to the crowd over the big screens "One more song???" The crowd roared in approval. Dave, apparently operating the camera himself, casually took a sip of a drink, paused, then held up two fingers to the crowd "Two more songs???" Deafening cheers. Taking his time to nurse a cigarette then panning the camera to the left, Dave got a shot of Taylor Hawkins (drummer) with a cigarette awkwardly sticking out his nose and a dazed look on his face. The crowd roared with laughter. Turning the camera back on himself, Dave now held up three fingers with an expression on his face that said "Are you sure?" At the climax of the loudest cheer of the night, the camera dropped and a sillouhette emerged from stage left, ran across the blue, backlit stage and picked up a guitar. And so the most memorable encore of my life began: the transcendent guitar jam beginning "In Your Honor" laid the foundation for what would be perhaps the most moving screams of the night when Dave pressed in to the microphone and shreiked "CAN YOU HEAR MEEEEEEEE?!!! HEAR ME SCREAMIIIIIING!!! BREAKING IN THE MUTED SKYYYYY!!! THIS THUNDER HEAAAAAART LIKE BOMBS BEATIIIIING, ECHOING A THOUSAND MIIIIIIIIIILES!!!" When "In Your Honor" was over, Dave turned to the crowd and confessed: "I don't know what to do next... any ideas? Oh and by the way, I know I said we'd do three songs, but we're gonna' do more than that- just so you know." "For All the Cows," the face-melting classic "Enough Space", "Big Me", and the more recent hit "Best of You" sealed the night in surrealism. 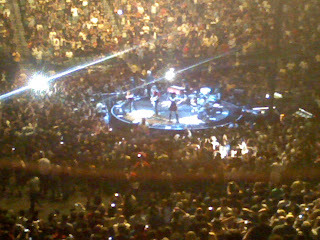 Finally, you should know that on the final song, "Best of You", some moron rushed the stage and made a big scene next to Dave Grohl (picture a drunk guy pumping rock signs with his fists 2 feet away from Dave on stage... now picture him getting tackled by two security guards (I laughed out loud) while Dave casually observes all the action without missing a beat (as if this happens all the time). 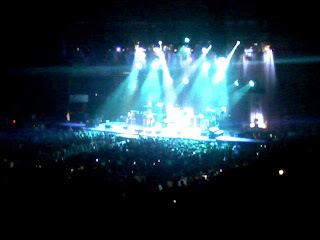 So dummy managed to make it through 4 hours of concert only to lose self-control on the very last song of the night. (Oo! Soooo clooose, my man!) The band finished the song with an epic jam, Dave once again yelled his thanks above the noise, slammed the final cut off and went on his way with a wave. With a toss of the drumsticks and one final bow, Taylor and the band followed their leader to the exit and in that moment the night somehow skipped my short-term memory and burned itself directly into that surreal place reserved for the most rare moments in life- when you know an experience has marked the start of a new era and its value in your memory simply cannot be described or measured, only talked about as a fable of transcendence worthy of many, many "big fish" stories to come. Thanks for reading. Duuude...thanks for making me feel as if I was there. I appreciate your attention to detail on what I agree is one of the best rock bands of our day. On that note, just got back from the Imax theatre where I saw U2 in 3-D. It's freakin' incredible. You'd love it.